In the fall of '97, four unsuspecting boys were abducted from their homes by a secret government agency. As part of a twisted psychological experiment, the boys were locked in a basement for months on end and forced to watch only MTV and reruns of the Canadian kids sketch comedy show "You Can't Do That On Television." As a result, the innocence of their youth was warped and maligned to the point of relationship dementia, a condition which forces the afflicted to write catchy, upbeat, pop songs about the awkward social escapades apparent in modern day suburbia. Upon their escape, these four vowed to bring their message of punk redemption to the relationship corrupt youth of Chicago and beyond. 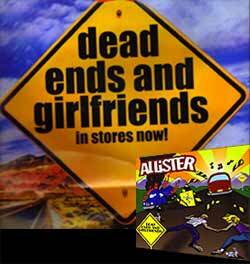 Allister was formed. So Who's Who You Ask? We just played the Surf and Skate Fest dates. Thanks to everyone that came out. We have a bunch of tour dates coming up, check back often for new dates. We just finished the CD, and are really excited about it. It will be out mid August. There are 16 songs on the CD. Moper- We found our selves signing, or typing rather, this one when we got bored. Its a song that makes you think. It has a darker sound than "stuck" did. It still rocks. Jacob Thinks I'm Gay- Just the title tells me its a song that'll make me laugh. Its a fast paced song that i'd see myself turning up loud just to dance insanely to. - (lacey) I just downloaded some songs from mp3.com and the more i listen to them i love them. I know i'll buy their "dead ends and girlfriends" cd. I'm sure erica would feel the same.